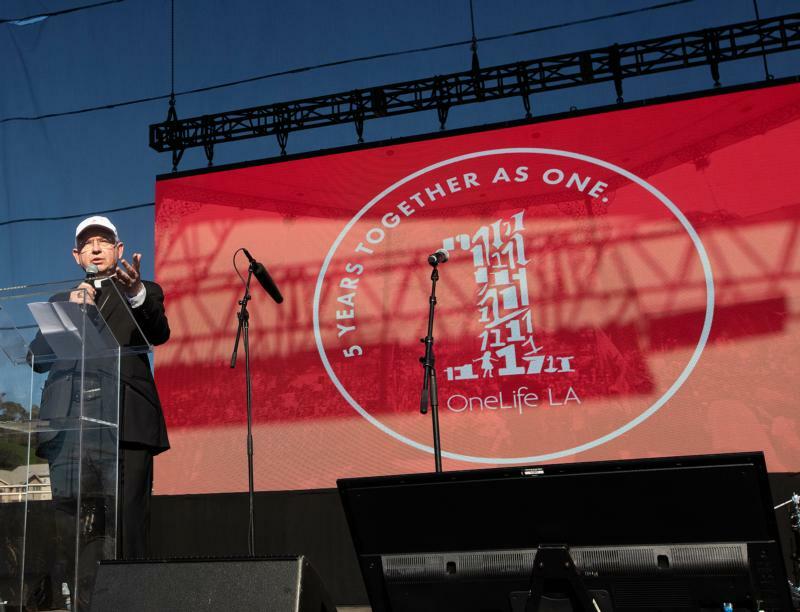 LOS ANGELES (CNS) — The annual OneLife LA “is about the light, not the darkness,” said Los Angeles Archbishop Jose H. Gomez, who was joined by about 15,000 Southern Californians for the fifth annual event Jan. 19. The event kicked off at noon at the city’s birthplace, La Placita. After he delivered his remarks, the archbishop, along with the archdiocese’s auxiliary bishops, led the pro-life walk from Olvera Street to Los Angeles State Historic Park for the official program and celebration. Keynote speaker Lizzie Velasquez, a global motivational speaker, YouTube personality, anti-bullying activist and author, shared her story of overcoming bullying, which she started to suffer at a young age due to her appearance caused by a rare disorder that prevents her from gaining weight. The fact that she is vision-impaired only added to the challenges she faced. Velasquez shared how the unconditional support of her family helped her become a strong woman and motivate others to speak up against bullying. “When I was born, I had a lot of medical issues. The doctors told my parents basically, ‘Expect nothing,’ and right then, my parents said, ‘God sent her to us for a reason and we’re going to love her to the best of our ability,'” Velasquez said. Also addressing the audience was Abby Johnson, a former Planned Parenthood director who has become a prominent pro-life activist after resigning in 2009. “For me, it’s been a journey of healing to know that the world is seeing me when I was at my worst but also gets to see my heart changing and the ultimate redemption through the grace of God,” said Johnson, who will be portrayed in the movie “Unplanned,” based on her book with the same name. Beatriz Sandoval, formerly a homeless mother who uses her experience to fight homelessness and poverty in Los Angeles, shared in Spanish her story of financial and mental struggles that she and her family overcame in part with the support of their church community. The event was emceed by Gloria Purvis, host of EWTN Radio’s “Morning Glory,” and Damon Clarke Owens, founder and executive director of JoyToB, a ministry centered on St. John Paul II’s theology of the body. The crowd also heard from Dr. Jose Villela Vizcaya, a Mexican psychiatrist who, as a medical student, faced a car accident that left him without mobility and sensitivity in most of his body. He became a renowned public speaker, and is currently a swimmer who competes in the U.S. Paralympics. He is ranked in the top 10 within his category. Others who addressed the crowd or performed included Rick Smith, founder of Hope Story; two-time Grammy nominated singer and songwriter Jamie Grace; Barbara Padilla, a soprano born in Guadalajara, Mexico; Nancy Sanchez, a three-time award-winning jazz vocalist ; singer-songwriter Mario Alberto Perez, who uses his talents to evangelize through music; and Ryan O’Hara, content director for St. Paul’s Outreach, a national Catholic organization that ministers to college students on campus. The day concluded with the annual Respect Life Mass celebrated by Archbishop Gomez at the Cathedral of Our Lady of the Angels. “We are praying tonight for the unborn. This word — unborn — reminds us that life begins long before we ever see it,” he said in his homily. “The Bible tells us that every human life begins with the desire of God. “It blocks God’s plan for a child he loves, for a soul he wants to be born,” Archbishop Gomez said. “Let us work every day to build a new city and a new nation — where every human life is loved and protected; where it is easier to love and to give life,” he said. The Los Angeles Archdiocese’s Office of Life, Justice and Peace spearheads OneLife LA. Other groups involved this year included 40 Days for Life, By Your Side LA, CAST: Human Trafficking Coalition, Catholic Charities Esperanza, Covenant House, Family Promise, Foster All, Harvest Home, Los Angeles Pregnancy Centers, Olive Crest, Options United and Santa Teresita: Carmelite Sisters End of Life. “OneLife LA is a very simple concept,” said Kathleen Domingo, senior director of the Office of Life, Justice and Peace.